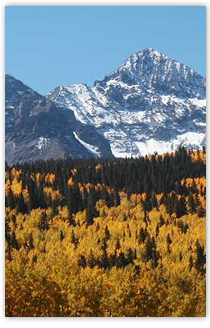 The Telluride region is a place one must see to believe. As a small, twinkling jewel, situated off the beaten path and marked by intimate communities tucked amid massive peaks, the entire area could easily be overlooked on a map, in a plane, or on a road trip. That is why those who come here do so because they want to be here, because they have intentionally stumbled upon the towns and mesas that comprise this slice of southwestern Colorado. As the alpine sovereign over its surroundings, the Town of Telluride is only about one square mile in size, with its nearest traffic light 37 miles away. It’s a spectacular place, paired with an entirely genuine demeanor. Telluride’s picture-perfect Victorian architecture is unassumingly hidden at 8,750 feet beneath the jagged and precipitous San Juan Mountains. Its sophistication as a world-class ski resort, threaded with internationally-renowned cultural festivals and events, is disguised behind a casual, informal persona that even famous personalities love to escape to. And its overzealous enthusiasm for the outdoors and close-knit, progressive community are both fronted by small-town charm where familiar faces constitute virtually everyone. Although Telluride’s resident population is only about 2,500, those who visit once, or live here part time, could likely attest that many more would love to call it home. On the other side of the box canyon and connected by the free 13-minute Gondola, Mountain Village is a community all its own. Incorporated as a town in 1995 and abutting the mountain’s ski runs and four lifts, Mountain Village is considered the true ski area base. It’s also home to the Telluride Ski & Golf Company’s headquarters, the Telluride Golf Course, Telluride Ski & Snowboard School and most of the region’s large resort hotels. At 9,545 feet, Mountain Village takes the term ‘ski town’ to new heights with its youthful grace and rapidly evolving infrastructure that includes new government offices and a 14,000-square-foot grocery store, as well as several new luxury development projects. It is the quintessential mountain escape, where sunlight bathes its nooks and crannies all day long and panoramic vistas creep into every vantage point. Large homes dot the periphery of the golf course and border the ski area, while a pedestrian Village Center evokes a feel similar to European resorts. And even with a refined elegance that offers decadent spa treatments, fine restaurants and stylish boutiques, Mountain Village is still a place where jeans with sneakers are acceptable any day of the week, and the state-of-the-art Telluride Conference Center is just steps from a hot dog stand.